A couple months back I decided for no reason to train and race in a Duathlon. I knew I wanted to do a muli-sport, knew I wasn't a competitive swimmer, and settled on a Duathlon. A duathlon is a two-sport race hence the name where you run, bike then run again. Not to be confused with a bi-ahtlon that combines cross country skiing and shooting things with a rifle! There are various distances just like in a Triathlon from sprint, Olympic to full. Read official distances here. I consulted with a talented triathlete I know named 'Jim' who recommended a local race held by 'Wolf' in the San Pablo Dam area, Orinda, CA. I knew the area was hilly, beautiful and given the next race was a month away jumped at the chance to race it. I signed up for my USATriathlon membership, for the race (Thanks Forward Motion for the race discount) then got serious about training. I know how to run, I've biked in the past but racing where you are supposed to transition quickly from run to bike to run was a totally foreign concept. I was told to work on my 'bricks' in a comparable area as the race so choose : Palomares. 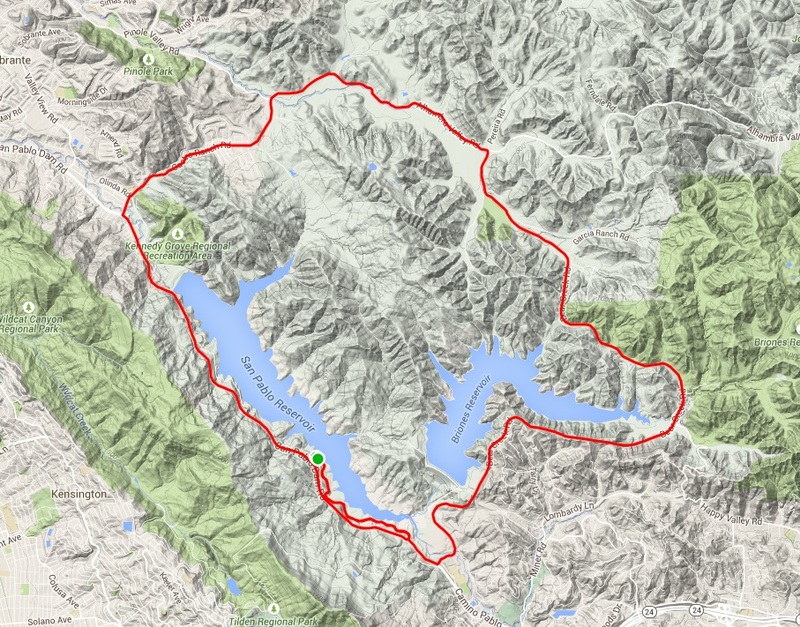 Palomeres for me is a nice ~25 mile out and back with 1500' elevation gain - dubbed an 'intermediate ride' by most. So, to train I would ride Palomeres first then pop over to my garage and transition to my running gear in as little time as possible then out to the nearby Sports Park for a 4-6 mile run. The first time I did my first brick I couldn't run in a straight line and had a hard time controlling my legs - very embarrassing. By my fourth brick I was getting pretty good at transitioning and keeping a decent pace on tired legs. Which is the point I guess. After reading the pre-race briefing I arrived an hour early to help rid pre-race jitters with a nice jog around the reservoir. Also met an energetic guys running around setting things up and turned out to be the race director : Wolf himself. Race directors have difference ways of setting up the transition area including how gets to put which bike where. Wolf sets it up where the oldest and youngest get prime spots then as you go along the pipe furthest away from where you enter the transition area are the most 'capable'. I waited until the first person in my age group racked their bike to see how they did it - and just copied them. Below is my humble Trek Madone roadbike against a significantly more expensive Cervelo setup. Jim's total time was 1:49 to my 2:19! My max speed was 38 to Jim's 45. I averaged 13MPH to Jim's 18! Jim finished 7th overall and is just strong. I had a good time for my first and have alot to learn from beasts like Jim on how to transition and climb hills. 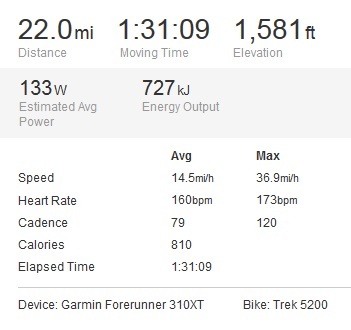 The 22 mile bike section didn't have any hills that were so steep that you had to get off your bike, but I sure was glad I road with a compact crank and 28/12 cassette! And where there is an up there is a down and I maxed my said gear ratio coming down at about 37 MPH. I knew going in that there was my first race and at this location so I keep a constant conservative pace. A couple times I wasn't sure if I was on the right road or not but it was just nerves talking because Wolf placed orange cones with the Wolf logo so it was pretty hard to miss turns. At ~1581 ft vert over 22 miles, there is enough rollers, twists and turns to keep you focused on the road in front of you. My bike part time of 1:31 hours was solidly 'middle of the pack' (out of range 1:02-2:03) and would like to return and hit the hills a little more aggressively. I don't have a picture of the start/finish table but had coffee and bagels for breakfast there then at the finishers table Pizza, fresh fruit and drinks. Wolf, volunteers and 'competitors' all had a great time with very comfortable weather. Wolf goes out of his way to make sure everyone feels welcome and celebrates all accomplishments (first ever DU, youngest/oldest finishers, etc). I definitely plan on doing another 'Wolfpack' race in the near future! Luckily not many showed up in my age group and squeaked out AG 3rd place!